"Where in the world do I get quality business card paper from?!" If you are printing your own business cards, you are eventually going to be asking this same exact question. Since I know everyone doesn't speak paper, I will make it easy for you by breaking down what paper is best and where you can buy some (see below). Unless you plan on cutting the paper yourself — which is NOT a good idea — you will want to buy the type of paper that comes already perforated. So that once you have printed your business cards you just (carefully) tear them apart. 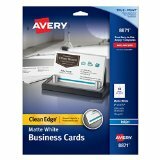 The best type of pre-cut, perforated business card stock to get is the kind that specifically says something like "Clean Edge." These will actually break very clean and look professional compared to the jagged edge you tend to get from the regular perforation. You don't want the jagged edges because they are a dead giveaway that you printed your own business cards. 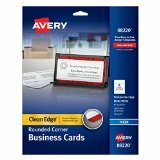 There's no particular brand that's better than the other in my opinion, but of out of all of them... Avery business card paper is the most popular. They make it very easy for you to setup your business card because they number their products to match a blank template online that you can download for FREE so that the whole process is easy from design to print. Before making a purchase, make sure you choose the paper according to what type of printer you have at home. Most likely you will either have an inkjet printer or laser printer. Even if you where to choose the wrong type of paper it shouldn't make an epic difference but it's best to purchase the right type so that the printing quality is at it's optimum. 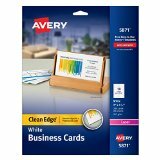 Where can you buy business card paper stock? You can normally find this type of card stock paper at most office supply stores like Office Depot, Staples, and Office Max. But you can probably find the same paper for a cheaper price on Amazon.com. Here's a few items I recommend below. If you want the classic business card look, this is the best paper to buy. 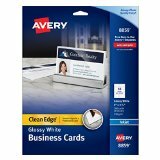 Avery Two-Side Printable Clean Edge Business CardsIf your business card design is mainly image based, then you should try this glossy stock to best showcase your design. It's news to me that you can actually print rounded corner business cards right at home. Pretty cool! On Amazon.com, I couldn't find a lot of variety for those of you with laser printers. Yet, they at least have the traditional business card stock that's good for the majority of you who are trying to print a card on a white stock.